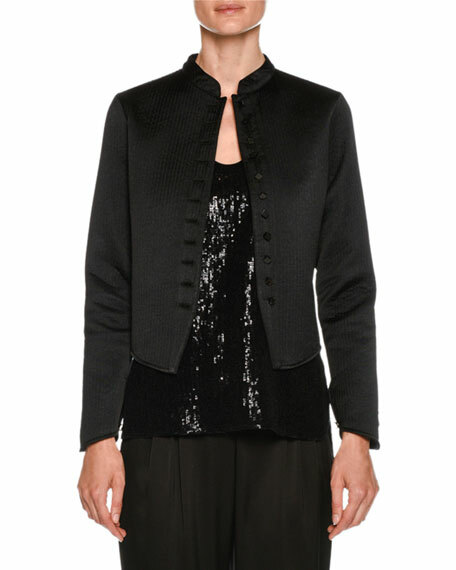 Giorgio Armani jacket in silk grosgrain. Neru collar; jeweled button front. 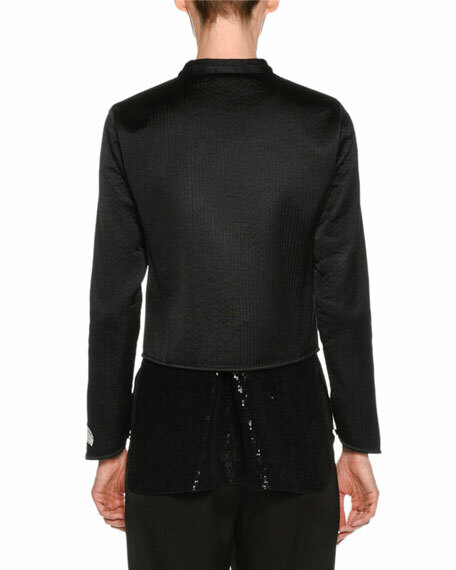 Giorgio Armani jacket in bonded satin. Funnel neckline; double breasted front. Long sleeves. Semi-fitted. Cutaway hem. Polyester. Lining, polyester/spandex. Made in Italy. Giorgio Armani jacquard jacket with diagonal stripes. Small, notched collar. Two-button front. Long sleeves. Front welt pockets. Relaxed fit. Polyester/spandex. Giorgio Armani jacquard jacket with diagonal stripes. Small, notched collar. Two-button front. Long sleeves. Front welt pockets. Relaxed fit. Polyester/spandex. Lining, nylon/spandex. Made in Italy. Giorgio Armani topper jacket with contrast satin collar. Open front; ruched drawstring collar. Long sleeves; tab cuffs. Relaxed fit. Below hip-length. Viscose/nylon. Lining, polyester/silk/nylon. Made in Italy. Giorgio Armani blazer in virgin wool. Notched lapels. One-button front. Long sleeves; one-button cuffs. Tailored fit. Lining, viscose/spandex. Made in Italy.